Pack up your sweets in style with Paper Mart’s collection of premium candy packaging. Whether you’re a big-time candy manufacturer, a small sweet shop, or a home baker, you need the right packaging to send your sweet treats off into the world. 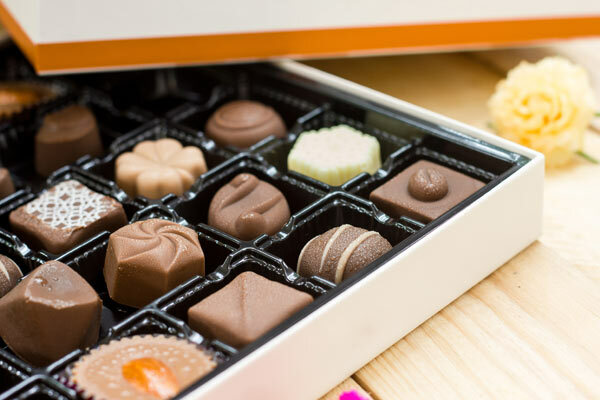 Packaging candy can present a unique set of challenges, so make sure you stock up on materials that will protect perishable goods and prevent leaks and messes in the event of a chocolate meltdown. Paper Mart has over 4,000 candy packaging options, from boxes to bags in wide varieties of style, materials, and colors. Here is a round up of our favorite candy packaging options. Ballotin candy boxes with tapered sides are a classic candy packaging option. Our Ballotin candy boxes are available in a variety of colors and sizes. They’re also the ideal compliment to our foil liners, gold candy trays, and glassine candy cups! Put your sweets on display with these view-top embossed candy boxes. These premium boxes have a clear top so you can view your treats at a glance (or entice hungry customers). They also come with divider inserts so you can mix chocolatey and fruity sweets with no fear of flavors mingling. Offer a full presentation of your decadent treats with these hexagonal plastic boxes with gold bottoms. They’re easy to assemble and large enough to house small cakes and cookies. We love them as beautiful party favors and as a safe and secure take out option for customers. Make every day Valentine’s Day with these polka dot heart boxes. These boxes come pre-assembled and lined with paper to prevent any messes and they feature a light pink polka dot lid paired with a chocolate-colored box bottom. They’re the perfect candy packaging option for sweet gifts to loved ones. Gable boxes,with their sturdy construction and top handle, are a favorite when it comes to candy and food packaging. Easy to assemble, the sides simply fold together to form the box. Gable boxes are a great way to take home treats after a party or event, or they can be packed with a variety of sweets in-store. For an elegant way to display candies like jelly beans and mints, we love these windowed paper candy boxes (available in embossed silver or gold). They have a beautiful embossed exterior, a smooth matte white lining on the inside, and clear plastic window. These boxes are great for packaging candy and they’re easy to use! These embossed paper candy boxes conveniently lock at the top with a sliding tab for safe and secure closure. Metal containers are a durable and sustainable candy packaging option, and we have a variety of styles and sizes to suit every candy need. Round tins with clear tops are perfect for displaying mid-sized sweets, while small slide-top tins are the ideal vessel for discretely storing mints. These dainty favor baskets are an excellent packaging option for candy favors sending guests home with sweets after a springtime soiree. Their cute basket weave container is perfect for springtime fun! Available in a variety of colors, these baskets close with a pull string top, keeping your candies stylishly secure. Wood boxes are a unique and rustic way to display and package any assortment of sweet treats. We offer boxes in a wide range of sizes and styles closing with cap tops, slide tops, and hinge tops. And don’t forget to pack your candies with colorful gift shred for added cushioning — and a touch of pizzazz. These are just a few of our favorite premium candy packaging solutions – what are yours? Let us know! Tag us on social media with #MyPaperMart. We are always so inspired by your creative packaging designs. Need help finding the premium candy packaging solution for you and your small business? We know that with such a wide variety of candy packaging options you’ll be able to find what you need for any occasion. Reach out to us about your candy packaging needs, and we’ll help you find exactly what you’re looking for at the sweetest price. I love that you talked about the guide to premium candy packaging. What I like the most is the Hexagonal Plastic Box with the gold bottom, isn’t it lovely? I found it interesting when you said that it is easy to assemble and large enough to house small cakes, candies, and cookies.